Sometimes you need a grilled cheese sandwich. Or two. Yesterday was kind of one of those days. I ate all of shown sandwiches. All. Pete was out of town and my kids are on a “Frozen” bender. So it was pretty much just me eating grilled cheese and having a pinterest binge while listening to my kids sing “Let it Go” 7,596 times. Also, Coco likes to accompany the singing with her playing her violin. It is something else. Maybe you are having one of those kind of nights? 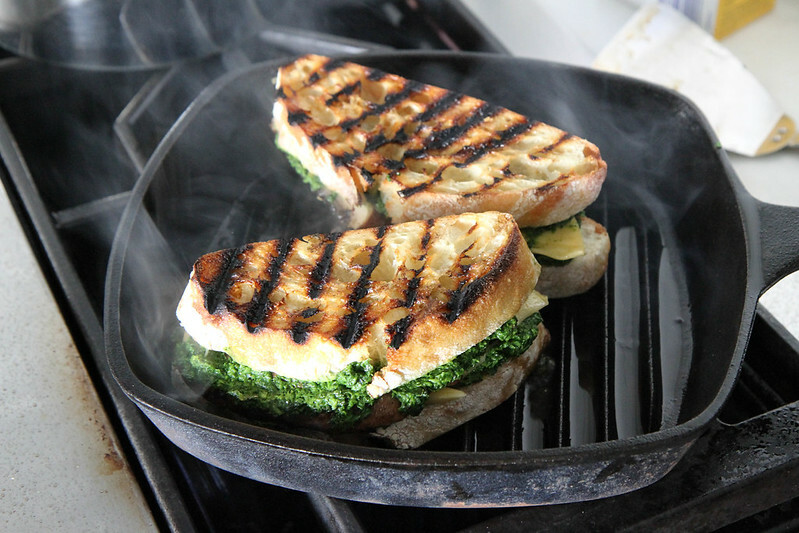 Make this grilled cheese for the most DELICIOUS veggie meal. It’s even better when you dunk it in some soup. (I did lentil- which I will post on Thursday), but Tomato Basil would be amazing too. Heat a griddle to high heat. Drizzle the mushrooms with olive oil and sprinkle with kosher salt. Cook on each side until the mushroom is soft and tender, about 4 minutes on each side. Meanwhile make the kale pesto. 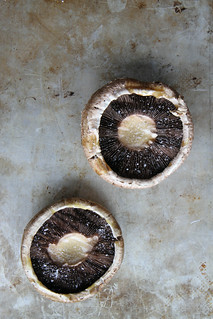 Pull the mushrooms off the griddle and slice each mushroom into 4 or 5 slices. 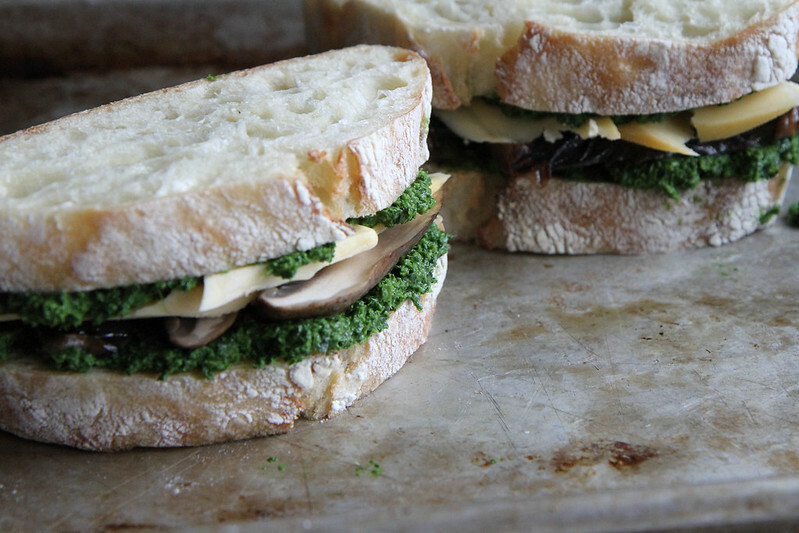 Slather all 4 slices of bread with the kale pesto, and then pile the mushrooms on one side. Add the gouda cheese and top the sandwiches with the second piece of bread. Add a generous amount of olive oil to the pan and cook the sandwich over medium-high heat until golden and crispy on both sides with the cheese melted. Slice in half and serve hot! Heat a griddle to high heat. Drizzle the mushrooms with olive oil and sprinkle with kosher salt. Cook on each side until the mushroom is soft and tender, about 4 minute son each side. 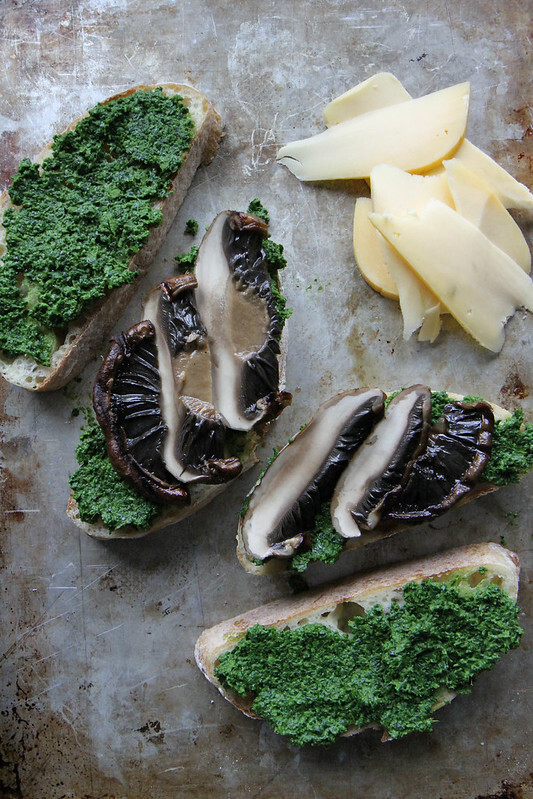 Pull off the griddle and slice each mushroom into 4 or 5 slices. Hahahaha, Heather, bless you and ALL of your gorgeous sandwiches! And your delightful girls. Thanks for making me smile on this cold, snowy morning. I would have eaten ALL of them, too. haha! thank you Nancy 🙂 that means a lot! OMG. This looks and sounds incredible!! I love the idea of this sandwich, not to mention all the ingredients! 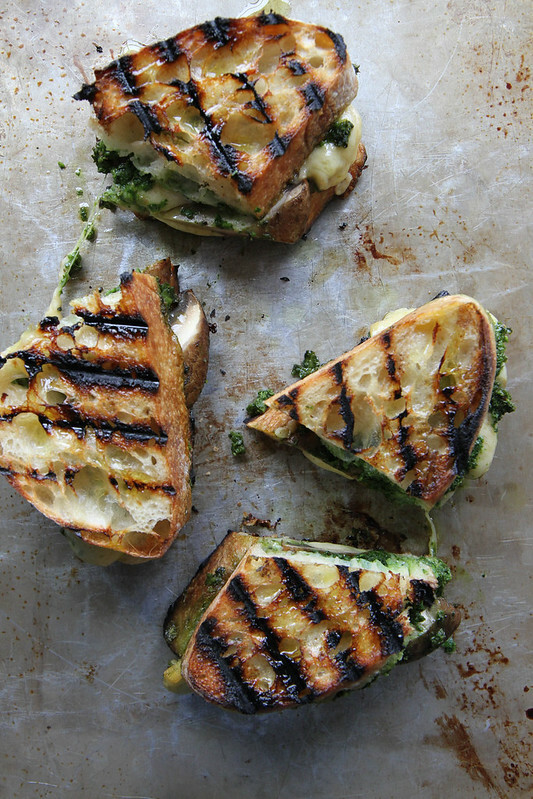 Love the flavour and texture combos in these grilled cheese! 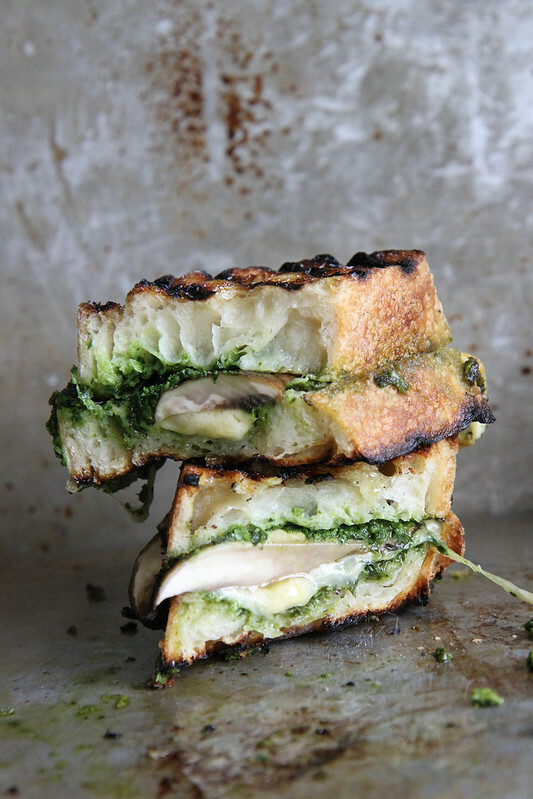 The kale makes this the healthiest grilled cheese sandwich ever! Could this sandwich get ANY tastier?! Wow, thanks for sharing this delicious recipe! Stop it! This is so amazing 🙂 Mmmmm! My kind of meal! 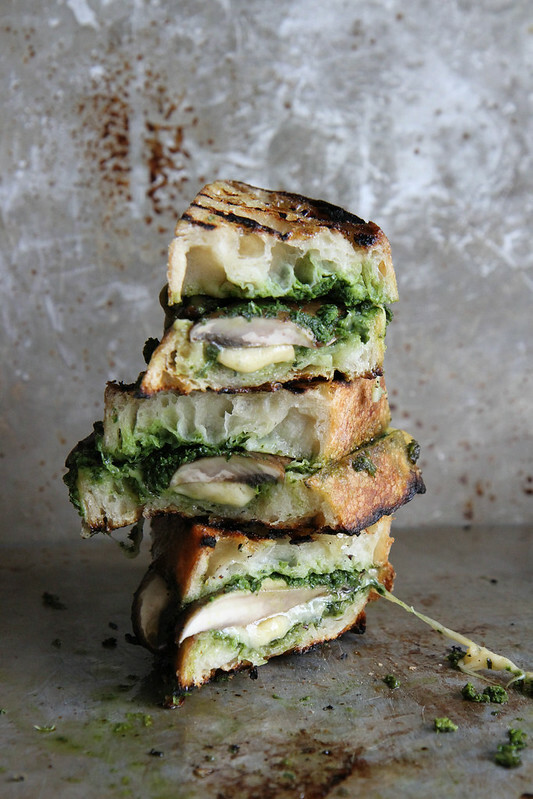 And I have hard and hard if pesto in the fridge, so this is a must make! AMy- I am with you, I am pretty sure Gouda just makes everything better! Ahh this sandwich looks like heaven!! I have to watch Frozen and listen to the song ‘let it go’ – i’m sure it’ll be in my head too! Haha your girls sound so adorable! 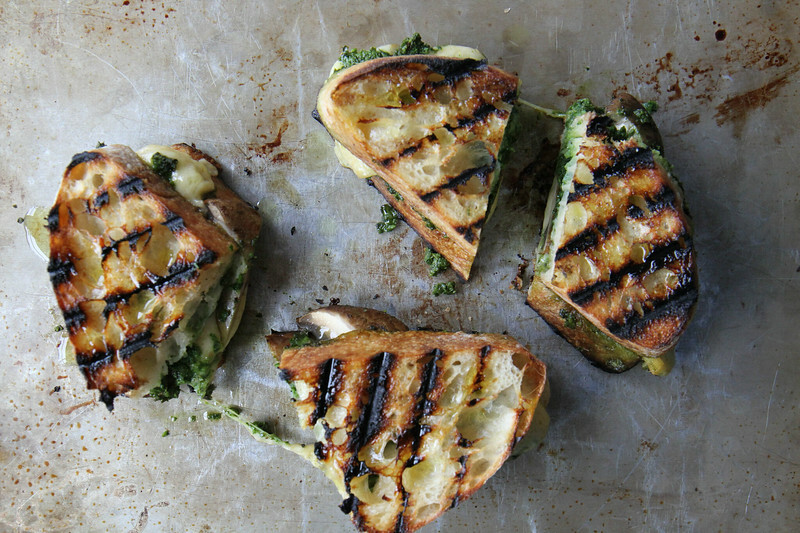 Love everything about this grilled cheese! This sandwich has quite an ‘attitude’ — love it! Oh yum! This is my kind of sandwich. There is no such thing as a time that I don’t want a grilled cheese sandwich – and with all this rain, that’s all I want! These are gorgeous! I’m drooling, Heather, and your photos are crazy good as always. Can’t wait for the lentil soup!! Holy awesome!! I love the sound of these! lol!! Laura- my thinking exactly! Truly an AMAZING creation Heather!!! Kale pesto, eh? That is different. I never would have thought of that but it looks like it works perfectly with this delicious looking grilled cheese. Great photos and great sandwich. Kale pesto is seriously the best thing EVER! I think you have to try it to believe me! This is basically the best time my eye balls have ever had. Ever. Excellent recipe. 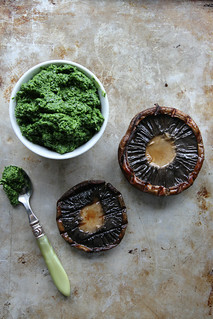 I love pesto &mushrooms. I’m a Certified health coach for Take Shape For Life. For our Lean & Green Meals I’m always looking for recipes. Plus I’m vegetarian. I can make Portabello wrap with kale pesto!! Thanks for the idea. i just made this with my own twists: spinach pesto, instead of kale, because we took home a TON of spinach from the farmers market last week….also used sharp vermont cheddar instead of gouda because that is what i had. also used pork jowel (guancale) because thats what i had in the fridge instaed of mushrooms. i used focaccia and sliced it through the middle for each half of the sammy. this pannino was out of this WORLD!!!! That sounds SO Good!! I love the addition of Spinach- what a great idea. And who doesn’t love focaccia??! looking awosme ….can’t wait to try this.. !!! Just made this tonight for meat-free Monday, and it was great! Love the kale pesto, and the hubby liked it too. thank you!! What type of bread did you use? Thick and lots of air for inner fluffiness.